My cousin Casey stained and painted this adorable table and chair set for the babies as their "big brother/big sister" gifts....they are LOVING sitting in the little chairs, eating at the table, pushing the chairs around the room, rearranging them, climbing on them...etc. After their nap today, they lined the chairs up in front of the TV, and were sitting in them talking to each other. I heard Hayden telling Bubby, "We sit together because we are friends." I grabbed my little point and shoot camera and snuck around the corner to take their picture....and these are the pics I got. Looking at them cracks me up, and reminds me why we bought a better camera. Two year olds are WAY too fast for a point and shoot....they move twelve times between the flashing of the red eye reduction thing and when the camera actually takes the picture. I will remember this next time I am trying to sneak up on a photo opportunity!! p.s. How about Hayden's naptime hair? I believe my baby is beautiful...she has a perfectly round little head, and the prettiest colored skin...her little eyes are so alert, and she already looks at me like she understands everything I am saying. She tracks things with her eyes, which are a dark blue gray. (which means they'll probably turn brown like her mommy's....which is fine with me....at least one of my kids will look like they came from me!) She has more hair than either of my other babies had, and it already curls a little bit on the back of her head. She has long, pretty fingers, and tiny feet. So you might be asking yourself why this blog post is titled "Winston Churchill"...well, her little upset tummy leads her to make some pretty weird faces. They crack us up, but have led people to make some pretty funny comments. Today my grandpa told me she looked like Don Rickles. And tonight, my mom and dad decided she looked more like Winston Churchill. Not exactly the kind of thing you want to be said to you regarding your baby girl. If she would just stop grimacing so much, people would stop comparing her to old men!! As funny as this whole thing is....I am worried the faces and the crying mean she is in pain, or her tummy hurts....she has to be held in some weird positions sometimes to make her happy, thus the picture you see here. Every time my mom tried to lay her back, she cried. As long as she propped her up like this, slouched over, she was happy as a clam, and slept just fine. Hopefully this phase passes....of course, she's eating just fine, so she can't feel THAT bad! I am sure you are looking at this photo and wondering what in the world is going on....this morning Cale came to find me, and told me, "Mommy, my diaper fell off"....I looked down to see his jammies still on, and wondered what he was talking about....until I saw him bending over, trying to grab his diaper and stuff it back in his pant leg. I just about died laughing!! The diaper was so full and heavy that it totally separated from the waistband, and fell out of his jammie bottoms. 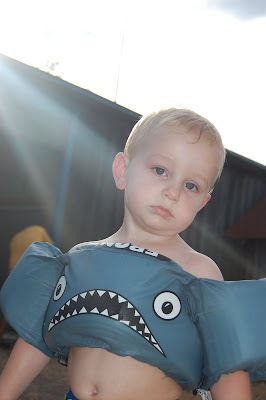 When I took off his shorts to change him, the little velcro tabs were stuck to about an inch strip of diaper, and it was torn completely off below that point. He couldn't understand why I was laughing so hard, but he was really proud of himself because he thought he did something super funny! 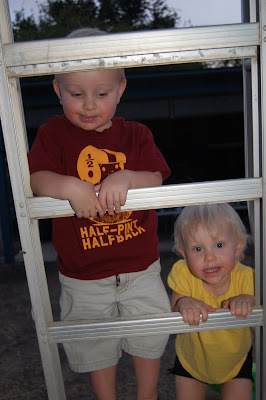 Tonight we hung out with the Zunker's at Aunt Joyce's "Wimmin Poo". The babies were SO excited to go....and kept talking about swimming with Parks and Davis at "The ant's house"...I spell it "ant", because we are pretty sure they thought we were talking about an actual ant. I wonder if they were surprised when we got there!!! It was such laid back fun....grilling (that Daniel's dad did, leaving us all to visit...THANK YOU!!) and swimming with the babies. 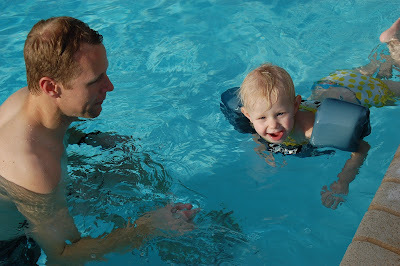 It is only three weeks post c-section for me, so I am not allowed in the pool yet, but I enjoyed sitting on the side and helping the babies in and out...Hayden told me on the way over there: "I am going to catch my daddy! 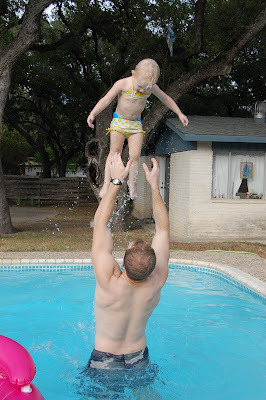 "....she loves that Daddy throws her in the air in the pool and catches her as she jumps in from the side. Cale is not so adventurous in the water yet. He tolerates being drug around in a floaty for about ten minutes, and then asks to get out so he can explore the yard. (And climb on stuff he's not supposed to climb on!) It's hard work watching two busy two year olds around a pool, but so fun to see how much they are starting to enjoy things like this...someday I will remember them swimming in their little swim diapers, with their faces stained red from watermelon and I will miss these summers from when they were tiny and so full of excitement...so I vow to enjoy every minute of it!! Cale got his first real big boy haircut today...as opposed to the the actual "first" time his hair was cut, which basically entailed Mimi chasing after him with sewing scissors, desperately trying to trim his scraggly mullet. 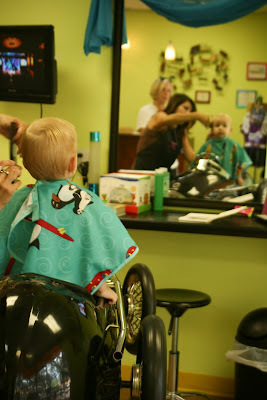 We took him to a cute little kids' hair cut place, because I wanted the first time to be fun...plus I wanted him to be distracted enough by the racecar chairs and kids movies that he wouldn't scream like a girl when the haircut started. Luckily, two other little boys were ahead of him, so we had to play in the salon for awhile before it was our turn....the babies colored in coloring books, wrote on the chalkboard wall, rode a little car, and ran around using their outside voice....By the time she was ready for Cale, he was right at home. 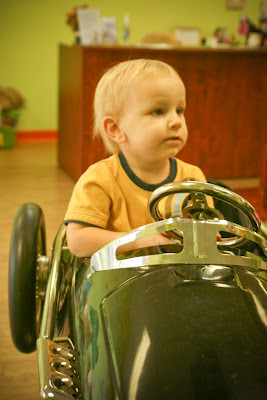 He picked a little black race car to sit in, and did way better than I thought he would. As soon as she had the apron on him, he started saying "I get down." We told him it wouldn't take long, so that quickly changed to "I get down in a minute." He actually sat still, and looked down when she told him to. 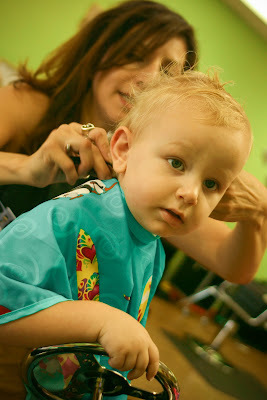 Mommy is a little sad, because his baby mullet is gone and he looks like a big boy! Hayden's comment was: "Bubby! You look like a handsome!" and she's right....he does!! This morning my sweet friend Dawn came over to take pics of baby Livi....she is interested in photography like me, and I was hoping to be in a few pictures, so...rather than take a bunch of Livi by myself, I enlisted Dawn's help. This "photoshoot" went awry from the get go....I got up early to get all three babies ready, and prepped the big babies about being in the photos with Livi. I set out a bunch of blankets, hats and props to use during our photoshoot...I tested out the light in the nursery to make sure it was bright enough....when Dawn walked in the door, Hayden ripped the bow off her head, started bawling, and threw herself on the floor. I knew right then we were going to be fighting an uphill battle!! Livi wanted to nurse the ENTIRE time. When we decided to take some cute naked pics, Livi decided to unload her bladder about three times...all over me, herself, and her rocker. If you're laughing, just wait! It gets worse! Dawn was in the process of taking some adorable pictures of Livi on the rocker when the pooping started.....it was like a California mudslide in the nursery. The twins are crying, and covered in melted M&M's (that were used as bribery to get them to "kiss the baby" in some pictures) By this time, we're laughing hysterically (because it was so ridiculously crazy....we'd cry if we didn't laugh) After a load of laundry, a bath for Livi, and some more nursing to calm her down, we actually got some cute pics. 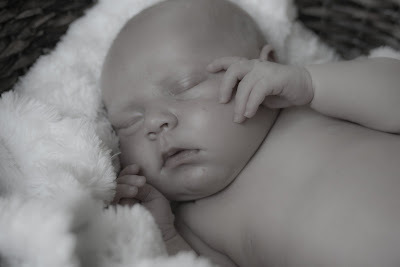 Here are a few preview pictures for my readers to check out....I took about ten with my own camera just so I would have a few to play with using my photo editing software......you would never believe by looking at this serene baby how HORRIBLY she cooperated this morning!! So I have been feeling more than just a little bit guilty about spending so much time with Livi while I have two two year olds that still need me....They don't understand why someone is always on my lap when they want their mommy. I want them to feel special, and get to do fun kid things even though there is a tiny baby at home. Shawn and I have made an effort to do special things for them in the last couple of weeks to make the transition easier: going to the park, going to get ice cream, playing outside, etc....but those things are next to impossible to do while I am home alone with three kids under two and a half! So today, when Livi finally decided she had nursed enough (which is rare) I got out some watercolors and paper and showed them how to paint. I am embarrassed to admit this is the first time we've done this, but it's better late than never! I had to squelch my OCD impulses, since the first half of our "painting" experiment consisted of getting the brushes wet and mixing all the colors together in the tray. (something that I considered a Defcon 5 offense when I taught kindergarten!) Once we realized that the paint goes on the paper (as opposed to the floor and our legs) they really had a good time! I loved watching them paint, and listening to their commentary as they created.....Doing this made me realize I should have done it sooner...I think they are going to love art just like their momma! They were so excited to show each other what they were painting...and kept telling each other "Look Sissy! I made a big dinosaur!" or "I made a road!!" It was lots and lots of fun especially since watercolors come off of cabinets and floors! Last night the Zunkers came over for dinner and to squeeze on baby Livi....and when I say "squeeze" I literally mean "squeeze"....Parks and Davis LOVED Livi and wanted to hold her the whole time....they are WAY more interested in her than Hayden and Cale are...when Amy tried to pry Livi away from Davis, he could hardly stand it...he kept saying "Please?, please??" It was so cute!! Livi enjoyed being held (as always) but got a little confused and tried to nurse on Davis' face...clearly she has a one track mind!! I took Livi to the pediatrician this morning for her first visit.....and quickly learned that taking one baby to the doctor is WAY easier than taking two! 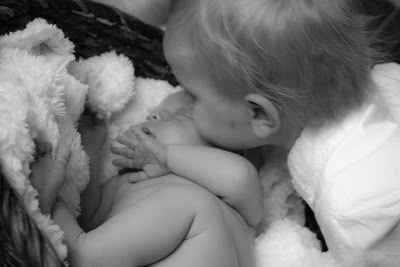 I'm not sure how I survived the newborn phase with two, but apparently I did, since I have two two year olds to prove it! I fed Livi before we left the house, but sure enough, the minute we sat down in the waiting room she decided she was hungry....I am not nearly comfortable (or granola) enough to whip it out and feed her in front of people, so she got an emergency bottle of formula, which she sucked down in about fifteen seconds. She has done nothing but nurse since we left the hospital, so I was hoping she had regained her birth weight....which she did! 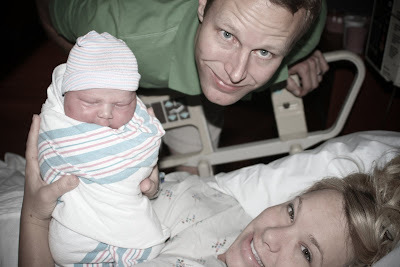 She weighed in at a considerable nine pounds nine ounces. She is in the 95th percentile in both length and weight, so it is looking like Shawn will end up with two daughters who are six feet tall! We're just going to keep our fingers crossed that Cale grows taller than these two girlies. Livi was SO good at the doctor...didn't cry at all during her shot, but hated her PKU test. She cried and cried, but fell asleep while I was checking out and stayed asleep for a few hours afterward. Besides the fact that she has a little infected tear duct (just like Cale did) she got a perfect bill of health!! So far, she is a PERFECT baby....sleeps all night and eats wonderfully....we are keeping our fingers crossed that this lasts! !